The National Emergency Management Agency (NEMA) said another batch of 139 deportees arrived the country from Libya on Tuesday. Mr Ibrahim Farinloye, the South-West Spokesman, NEMA, confirmed the deportation to the News Agency of Nigeria (NAN) on Wednesday in Lagos. Farinloye said that the aircraft that conveyed the deportees arrived the Murtala Muhammed International Airport (MMIA) at 11:20 p.m on Tuesday aboard a chartered Airbus A320 Afriqiyah aircraft with registration number 5A-ONA. The spokesman said that the deportees were also received by officers of the Nigerian Immigration Service (NIS), the National Agency for the Prohibition of Trafficking in Persons (NAPTIP), the Police, and the Federal Airports Authority of Nigeria (FAAN). Farinloye said that Mr Suleiman Yakubu, the Zonal Coordinator, South West, NEMA, received the 139 returnees from the officials of International Organisation for Migration (IOM). 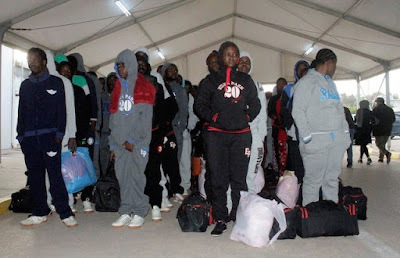 “Another batch of Nigeria voluntary returnees who were stranded in Libya and were assisted by International Organisation for Migration to returned to Nigeria on Tuesday. “After the profiling, we have 105 females comprising 101 female adults, three female children and one female infant. “We received a total of 34 males made up of 32 male adults, one male child and one male infant. “There are also three medical cases among the voluntary deportees from Libya,” Yakubu was quoted as saying. Farinloye noted that a total of 2,517 Returnees were deported from Libya by IOM from Feb. 29 to Aug. 29.